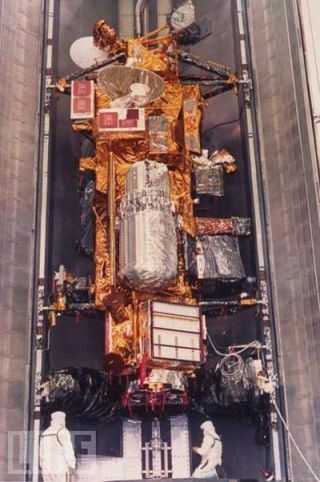 NASA's UARS satellite, which was decomissioned in 2005, and is now on the verge of falling back to Earth. This story was updated at 10:13 p.m. ET. A defunct satellite poised to fall back to Earth will make its death plunge during the last week of September, NASA officials now say. The spacecraft, an old NASA climate probe called the Upper Atmosphere Research Satellite (UARS), was decommissioned in 2005 and has been slowly losing altitude since. Soon, the 6 1/2-ton satellite will make a final uncontrolled plunge through Earth's atmosphere. While most of UARS' huge bulk will burn up during re-entry, some pieces are expected to survive. NASA insists these will pose little risk to civilians on the ground, although there is a chance debris could impact a populated area. This video simulation of the UARS satellite crash by the analytical firm Analytical Graphics Inc., shows how the satellite orbits Earth. NASA officials say there is a 1-in-3,200 chance that a piece of UARS satellite debris could strike and injure a person on the ground. The most likely scenario is that the satellite falls somewhere over an ocean. "Earth is big, the satellite is small; the chance of it hitting a person is very, very small," said Victoria Samson, the Washington Office Director of the Secure World Foundation, an organization dedicated to the peaceful use of outer space. "While the idea of something coming at you from outer space is unnerving, there are a lot more realistic threats we should be concerned about. The actual impact to any person is fairly minimal." At this point, NASA cannot confirm the exact trajectory or time of the UARS satellite's plunge, which depend on solar weather, variations in Earth's gravitational field, and the orientation of the satellite. However, as UARS' re-entry draws near NASA should be able to offer more precise predictions. The space agency first announced the spacecraft's impending dive last week. Since then, experts have been able to refine their tracking of the satellite, and confirmed its present orbit. "As of Sept. 12, 2011, the orbit of UARS was 145 mi by 165 mi (235 km by 265 km)," NASA officials wrote in a statement. NASA officials have said that should any of the 26 pieces of the UARS that are expected to survive re-entry fall near a populated area, the public should not touch the satellite debris. Instead, local law enforcement should be contacted. Any surviving UARS satellite debris cannot be kept or sold as they remain the property of the U.S. government, NASA officials said. The $750 million UARS spacecraft was launched in 1991 aboard NASA's space shuttle Discovery to study ozone and other chemical compounds in Earth's atmosphere. Since that time, international standards and best practices for dealing with a spacecraft's end of life have been put in place. "Now, they have to save enough fuel to either put the satellite in a graveyard orbit or guide it back in" to Earth in a controlled manner, Samson told SPACE.com. "That wasn't actually standard operating procedure back then." For that reason, uncontrolled re-entry of large spacecraft like UARS are rare, though not unheard of, Samson said.